This video will help you understand how heat moves in your home ,where energy loss occurs and how insulation can greatly assist in reducing this energy loss in both winter and summer. If you’re like the vast majority of homeowners you’re concerned about the costs of heating (and cooling) your home. There’s a good reason for your concern,research estimates that just under half (44%) of the energy used in the average home goes toward either heating or cooling the home. However, a homeowner may be able to reduce their heating bill by 10% to 50% simply by increasing the amount of insulation installed in their homes. Air naturally tends to move from warm areas towards colder areas and insulation restricts this natural movement. So, during the cold season, this prevents cold from coming into the house through the ceilings or walls, (it works the same way during the hot summer, keeping the cool air inside the house and blocking it from moving towards the warmer area outside. Most obviously, improperly insulated homes can waste precious energy in both heating and cooling your home by allowing precious heat transfer. And with energy costs as high as they are, this could cost you thousands of Rands a year and put unnecessary strain on your heater or air conditioner. Properly insulating your home with the right types of insulation can both save you money, and reduce strain on your heating and cooling systems. 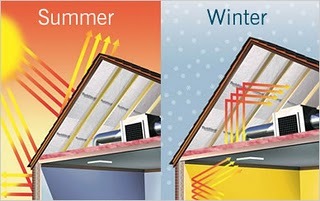 Insulation is measured by its R-value, – it’s resistance to heat flow. The higher the number, the more blocking capacity or insulating it provides. Different materials have different heat blocking capabilities, therefore different R-values. As well, the thickness of the insulation, where it’s installed and how well it’s installed will determine the total R-value of the insulation in your home. Since R- values are cumulative (they add together) the total R-value is the sum of the R-values of the insulation in any particular area of your home. Due to its sound absorption qualities, insulating materials actually reduce unwanted ambient noises generated by appliances, conversations, audio equipment, or other causes of noise pollution and prevents sound from being transmitted through the walls or floors of your home. Not only this, but properly insulating your home will keep it more comfortable by making it easier for your air conditioner and furnace to keep the temperature constant and consistent. Insulation should be considered as an integral and essential aspect in any energy saving strategy.